The plant holder is consist of a set of 6 pieces of climbing trellises, each trellis is designed with a hole on the top of the product for free assembling. If the plant is growing long and wide ,can not be hold by one trellis, you can assemble a second climbing trellis by insert the bottom of the second one into the top hole of first one, then you can make the trellis higher to support the plants grow higher. 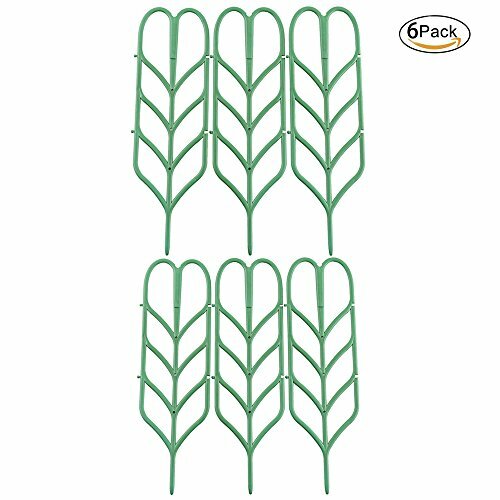 With this plant support sets, your plant would grow up along the plant support upward and together, it could effectively prevent branches and leaves scattered, so that plants would shape more beautiful, more healthier and more concise. Morning glory, Bean plant,Green radish other rattan plants. EASY TO USE: An easy-install arched decor garden climber trellis, potted plant trellis,tall garden trellis metal,trellis netting,no need to assemble. Just stick trellis into the Ground or secure the trellis onto a wall, fence or near a pot. If you have any questions about this product by Povkeever, contact us by completing and submitting the form below. If you are looking for a specif part number, please include it with your message.